At a recent greenmarket I bought a few onions that were a little sleeker and paler than the big fat deeply red onions I would normally buy. Turns out they are called La Rossa di Tropea or cipolla di Tropea or in plain English “onion from Tropea”. Photos of this onion that I have seen in Italian publications show it to be a very bright maroon-red, but the ones I purchased were almost a pinkish-brown. Apparently it is an onion that was brought to southern Italy by the Greeks and its cultivation perfected by the Arabs who settled there. Mine were simply raised by one of the passionate young farmers that inhabit the greenmarket in our neighborhood on Sundays. 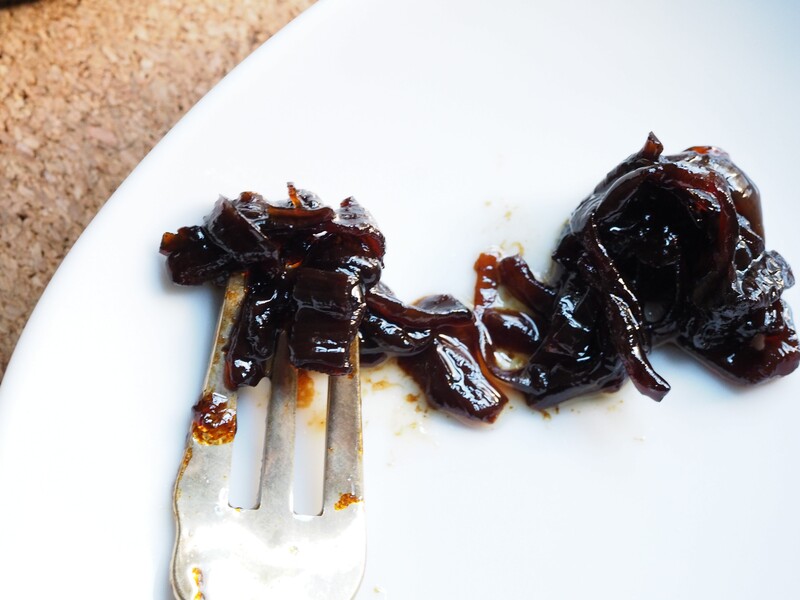 At first I was going to keep them for eating raw, but then I had quite a few ordinary red onions on hand so I decided to combine them to make one of my favorite condiments, onion marmalade. In Italy I believe the marmalade is made with red onion, roasted bell peppers, garlic, and a little chile. My version is simpler – just red onions. It keeps well and is terrific with roasts, steaks, and chops. The recipe is easy – takes time to cook — but very little effort. You can either make it on the stove top or in the oven; all you need is very low heat. Cut as many red onions as you like into thin strips. Toss them with enough olive oil to make them glisten. Place in a nonstick pan large enough to hold them in a relatively thin layer. Season with salt and pepper, sprinkle with a tablespoon or two of light brown sugar (more if you like sweetness), and drizzle balsamic vinegar over the top. Place over low heat and cook for a couple of hours, frequently tossing and turning with tongs. You want the onions to almost melt and all of the liquid to evaporate. Store, refrigerated, in a nonreactive container for up to 3 weeks. Bring to room temperature before serving. At the beginning of the month we were in Provincetown out at the end of Cape Cod. The stay is our most favorite fall get-away which we have been doing annually for over 10 years. Not only is the fish and shellfish extraordinary, but the Saturday farmers market gives us all of the earthly goodness to accent it. 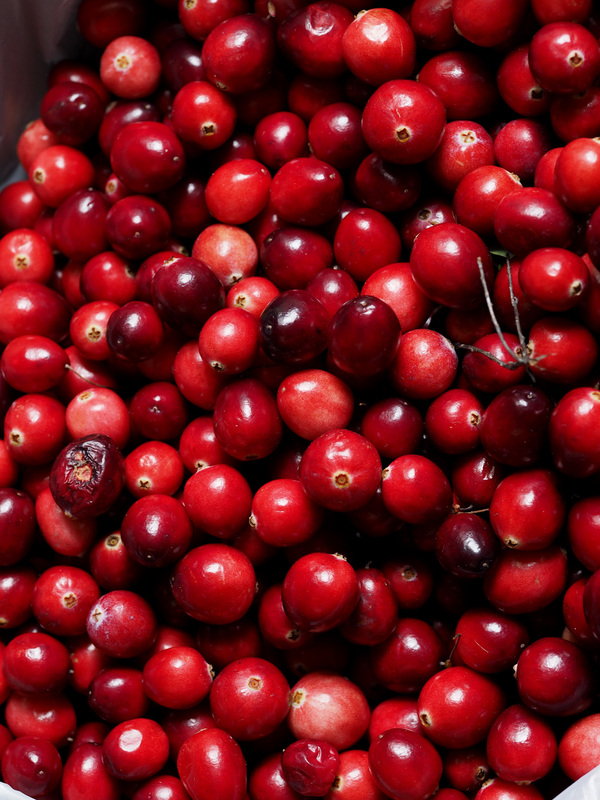 The last Saturday we were there brought the first cranberry harvest of the season. I bought a few pounds which I’ve turned into spiced cranberry relish for the upcoming holiday tables. Here’s the recipe, but you can find other cranberry recipes in my book, The Best Little Book of Preserves & Pickles, should you want further inspiration. This recipe should make about 1 quart of relish. Combine the cranberries, citrus zest, chile, mustard seed, and pepper flakes in a large, nonreactive saucepan over medium heat. Bring to a simmer and stir in the sugar and vinegar. Bring to a boil; then, lower the heat and simmer for about 20 minutes or until the berries have popped and the mixture has thickened slightly. Remove from the heat and either spoon into clean containers and store, covered and refrigerated, for up to 2 weeks. Or, pack the relish into clean, sterilized jars, cover tightly, and process for 10 minutes in a boiling water bath. The latter method will allow you to store the relish at room temperature for up to 6 months.